An article for the SHCGB Magazine, written in 2008 and three years after we came to Canada. Some men have affairs; some men have a Porsche; some men, my brother for instance, have an affair with their Porsche (would the mushing equivalent of a Porsche be a Sprinter 4x4 do you think?). For my mid life crisis I am giving up a well paid and secure job, throwing my lot in with Canada and hopefully heading off into the distant, cold and desolate north to run dogs. All four of these crises have several things in common; they can be fast, they can be fun, they can be expensive and they can all end in tears. How on earth did it all come to this? A question Louise regularly mutters to herself as she trudges around the kennel, poo pail in hand. (temporarily!?!) in pursuit of a dream. We had had some limited success in the ring and on the trail in the UK and had dreams of even more success in the North American show ring and on the snowy mid distance trails. Well, you can dream, can’t you? Then we had 9 dogs, naïve expectations and some money in the bank. Today we have 29 dogs, a collection of red lanterns, an extremely uncertain future and a whole raft of memories that I wouldn’t trade for the world. 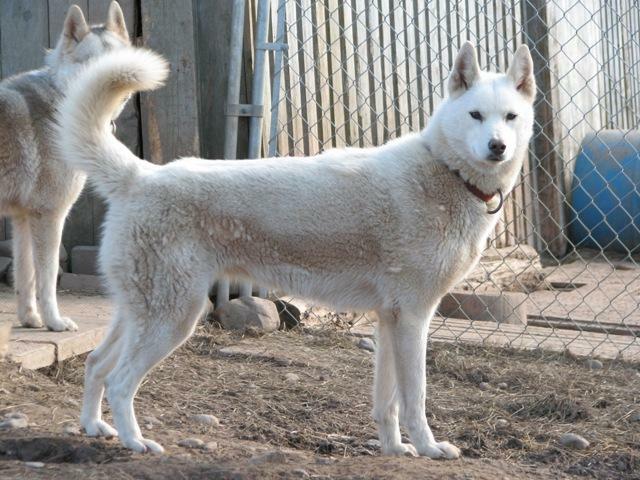 We have lost a dog and found him again, watched short-legged fat little things waddle around the show ring, often with an equally short-legged fat little husky in tow. We have driven somewhere in excess of 80,000 miles, taking in shows, races, seeing sites and having fun. We tried to take Charlie’s picture outside the Cheers Bar in Boston early on a Sunday morning but the batteries ran out in the camera; we considered lowering the same Charlie down onto Plymouth Rock so that we could get a picture of him peeing on the spot where modern America was born but decided that Guantanamo Bay was not for us. I have hiked to the bottom of the Grand Canyon and out again just to say I had done it, canoed the Yukon from Whitehorse to Dawson (just checkin’ out the route :) ) surviving close (ish) encounters with bears on the way. 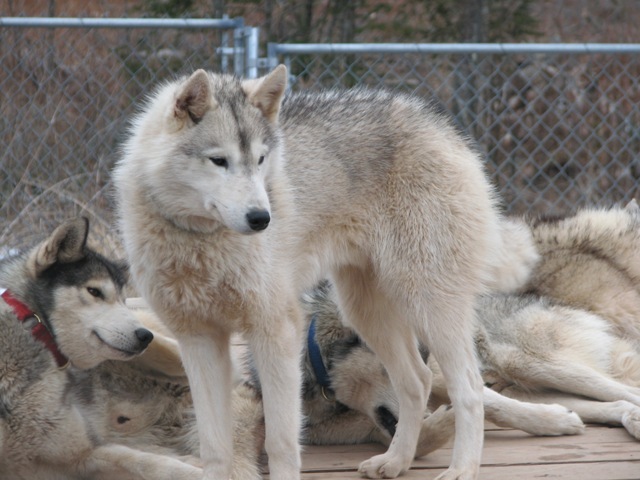 highlight some of the differences as we see them between owning Siberians in the UK and out here in the Colonies. 2. Buy the necessary equipment to run the dogs. 4. Pay for racing the dogs. 5. Finance the vet's new Pontiac. the ATV to push the van back onto solid ground and I reversed as opposed to going forward. incidents now; well actually we might laugh - one day … I hope! 0530: Get out of bed, shower and pull on as many clothes as possible. 0545: Remind Louise that we share the enjoyment of running dogs and so it is time for her to get up too. Go downstairs to start baiting water. 0600: Point out to Louise that it is getting late and we should both be outside embracing the experience of a -15ºC morning and so it is time to get up. 0601: Be reminded by Louise that she 'signed up' for the showing element of our dual purpose dogs - showing always starts at a much more civilised hour of the day and rarely, if ever, involves temperatures below freezing. 0602: Place a steak over my left eye to reduce the swelling that coincided with my third call for Louise to arise. 0615 - 0630: Louise loads between 14 and 21 dogs into the van whilst I load up ATVs and/or sleds and equipment depending on the weather and conditions. 0630 - 0700: Water, harness and where required boot the dogs. Feed any dogs that are remaining behind. 0700 - 0745: Drive to the training area (we tend to use an area about 40 miles up the valley from home as it gives unlimited access to in excess of 200 miles of wilderness trails). 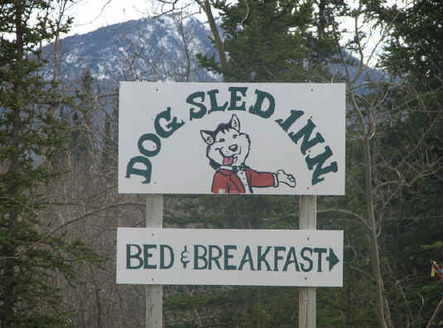 0745 - 0800: Arrive at the site, set up the sleds/ATVs. Hook up two teams. 0800 -1400: Run both teams together. 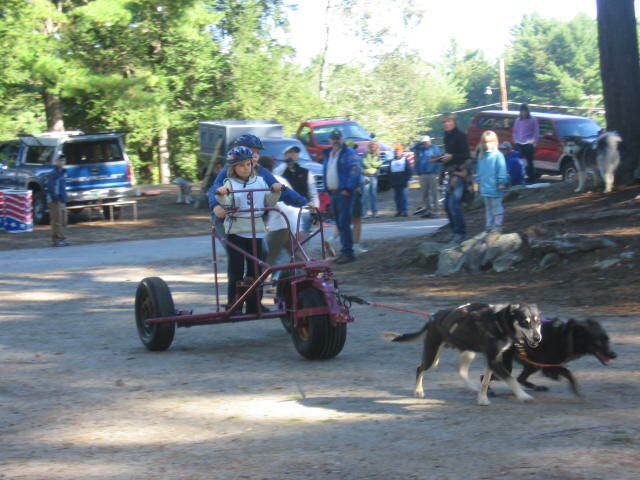 Approximately three weeks before a race we are aiming to cover either the distance of that race or replicate the time the dogs are likely to spend in harness over the course of the race. At other times we vary distance depending on training and conditioning requirements. Single training runs rarely last less than 4 hours and as we often have 2 teams and puppies that require training you can imagine how long a session can last. 1400 - 1430: Water dogs, deharness, check feet, drop the dogs. 1430 - 1500: Short run out for any puppies. Pack up the equipment. 1500 - 1615: Drive home and unload all the dogs back into the kennels. 1615 - 1645: Feed all the dogs; explain to the older dogs why they didn't get to go out, recheck feet and wrists. 1645 - 1715: Clean up the kennels and check the equipment ready for the next day. Dry out equipment where required. 1715 - 0530: Go inside and eat (its dark, what else should we do? ), complete the training log and prepare for the same the next day. stood on a sled behind 10+ dogs with temperatures down to -21 ºC plus windchill trudging along at 6-8 mph trying to build muscle and stamina (the dogs not mine) in equal measure gives you a whole new perspective (mine not the dogs). 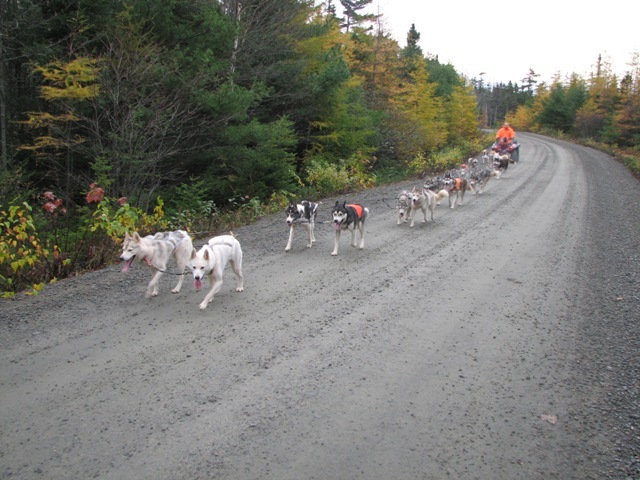 Of course the reason for putting ourselves through this is to see us, dogs and mushers, become a better team and really the only way to measure improvement realistically is through competition. 1. Distance of and to the race - because we have so far to travel to race (our closest race is about 9 hours drive away) we have focused entirely on mid distance races of 30+ miles. It would not only be senseless to drive 9 hours to race for about 4 miles (didn't we used to do that in the UK though - Doh) but the whole point of coming to Canada was to test our dogs out over distance - hence no sprint racing for us but lots of driving to get to the races. 2. 99.9% of races are on sleds. Dryland racing really is in its infancy over here - it was interesting to attend an ISDRA conference a couple of years ago where dryland rules were being formulated and the template for discussion were UK and European dryland races. And who says global warming doesn’t have some good to offer up. six dogs hooked up it feels like there is something missing – about four dogs, lots of power and a degree of adrenaline and fear to be exact. 4. Because of the size of the teams race hook ups are always done at your vehicle then the teams are led down into the start chute by handlers and volunteers. You still have one or two minute start intervals (we have yet to be involved in a mass start, although they do happen), and on one occasion there was even a two lane start chute meaning you were snubbed down next to the team heading out in front of you. However you do always seem to arrive at the start line completely ready for the off. 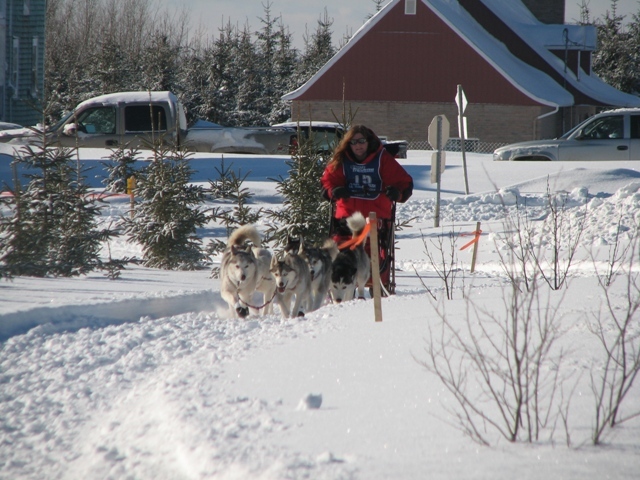 got involved in the race organisation and came out to cheer each and every musher as they passed through their community (at least they did in the three communities I made it to before scratching). 6. 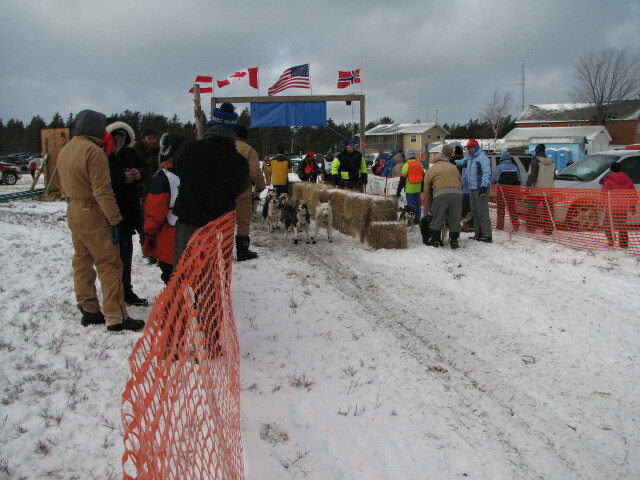 More prominence also seems to be placed on health checks (dogs as opposed to mushers) and although only a few races that we have attended required the entire team to be subjected to a complete physical by a qualified (and purely voluntary) veterinarian, all races require proof of in-date vaccinations to be on hand and vets are often seen out next to the trails keeping a weathered eye on teams. like BSHRA circuits, flat as you like (lets see if that gets past the censors). I still have nightmares about the Fort Kent 60 mile race course, it seems to be up hill for about 55 miles, then down off the mountain for a hair raising 4 ¾ miles then up a sheer cliff face for the final ¼ mile; at least that is how I remember it. the warm lodge drinking coffee and chewing the fat). It was much to everyone’s relief that we finished the race at about 0830 the following morning after having run through the night; I learnt so much about mushing at that race it is untrue. 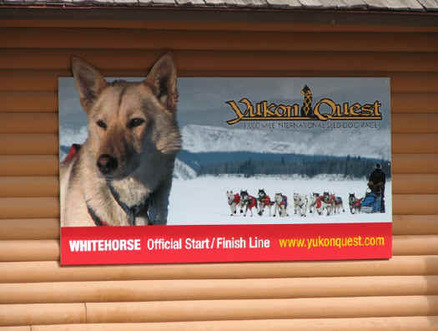 This winter we are not too sure where we will be racing and over what distance; if we have made it to the Yukon we’ll be training for 200 and 300 milers; if we haven’t managed to sell the house and are still in Nova Scotia then we’ll concentrate on 60 and 100 mile races again. 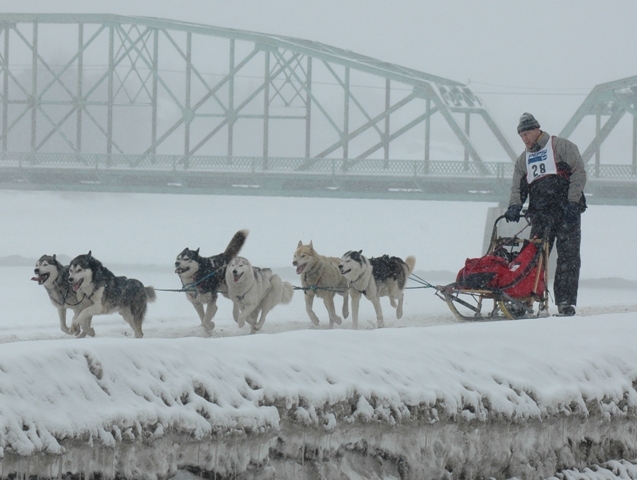 To enact, or even fail to achieve, races such as these requires one main ingredient - dogs. As it is the dogs that truly enrich our lives whilst absorbing the majority of our time, money and thoughts then that is all that remains to be discussed. registered Siberian Huskies living at the bottom of our garden. Oh yes and we are clinically insane! 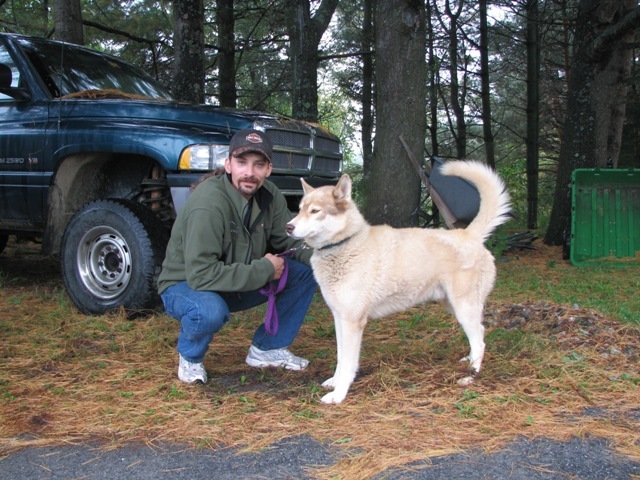 morning screaming and found myself living in Canada with 29 dogs, 2 ATVs, 4 sleds (5th on the way), I haven't a clue how many harnesses, lines, boots, bags of dogs food and everything else that consumes all my time and money but is essential to the life of the musher. Oh yes and a huge pile of dog poo and a very understanding yet often antagonised wife." (Maybe I shouldn't link dog poo and the wife in the same sentence, too often - oh well I am nothing if not insensitive). The ironic thing of course is that since we have had huskies we have had to give up mountaineering because we don’t have the time. Any of this sound even remotely familiar? To the reader who has happened across this article whilst still only owning one husky or even just considering going out to get their first - beware!! This too can happen to you. think, the husky equivalent of Mad Cat Woman in the Simpsons? refused entry back into Canada on one occasion. I do laugh about that one, basically because I was tucked up in bed in Nova Scotia whilst Louise was being turned back by the Canadian border guard at 3am on a Sunday morning. What makes the story even more amusing was that initially the US border guard wouldn’t let her back into the States either so she was literally stuck in no mans land. How I laugh about that, when she’s not looking. Do we have any complaints? None at all. We are delighted with every dog that has come to us. Nor have we gone to any extremes, we have tried to maintain the look and type that we had in the UK and I think that has been emphasised by our finally fulfilled but very long held desire to bring Zoox dogs on board. In my opinion not one of our dogs would look out of place in the UK show ring (they will rarely get shown over here) and although biased I think of the US dogs Cassie and Ammo in particular would have done extremely well showing in Britain and any of the other dogs would have held their own. I have little doubt that you will be seeing Ammo's brother earn a great deal of success for Hugh and Judy Wakker in the UK show ring and if we ever have any money again I think Louise will be bringing a few of our dogs back to the UK to show one day. period to come over the next few years so perhaps I'll subject the long suffering member to more of this rot in the future. 1. This is what the Siberian Husky can do to you. 2. Careful what you dream of, you can have the power to make dreams come true.